Our list of study tips explores ways to use the entire semester to prepare for finals, rather than one major cram session. It offers advice on time management and how reviewing material frequently will save you time in the long run. Ready to ace your test? Here you go! Your study session is only as good as your study materials. If your class notes aren’t easy to understand or are missing information, it will make studying more difficult. Here are some useful tips for improving your note-taking skills! Many college courses have suggested readings, as well as required readings, for each class. It’s often a good idea to read all the material as professors often pull questions or essay topics from material not covered in class. If you need help increasing your reading speed, check out this speed reading resource – it could help you get all that reading done much faster! With so many fun activities in school, study time can be hard to factor in. Learning to manage your time and balance your workload is a valuable life skill. Use your calendar and to-do lists to keep track of due dates and projects, and prioritize your tasks, as you don’t always have time to get everything done. Need some more time management tips to get started? Check these out! Be sure to review material throughout the semester, instead of relying on one big study session before finals. If you take 30 minutes to review your class notes every day, you’ll save yourself time in the long run, be more prepared, and save yourself from stressing. Spread out your studying! Music or noise machines can help create a great study atmosphere. Whether its classical, atmospheric music, or just the sounds of waves, breaking the silence is important, and will help you focus. Try joining a study group on campus. It can be a nice change from studying alone, provides an opportunity to quiz each other, and allows you to learn the material in new ways. Everyone approaches studying the same material differently, and study groups allow you to collaborate and learn in new ways. Different study times work better for different people; the important part is that you find the best study time for you. Morning and afternoon studying often means you have more energy, while night studying can let you focus more easily, or even be more creative. Find what works for you! If you do plan on longer study sessions, be sure to take study breaks and reward yourself for your hard work. Taking breaks helps you retain information, and if you never reward yourself, you will dread studying even more. Take a break and grab some coffee! Now you’re ready to ace that test! 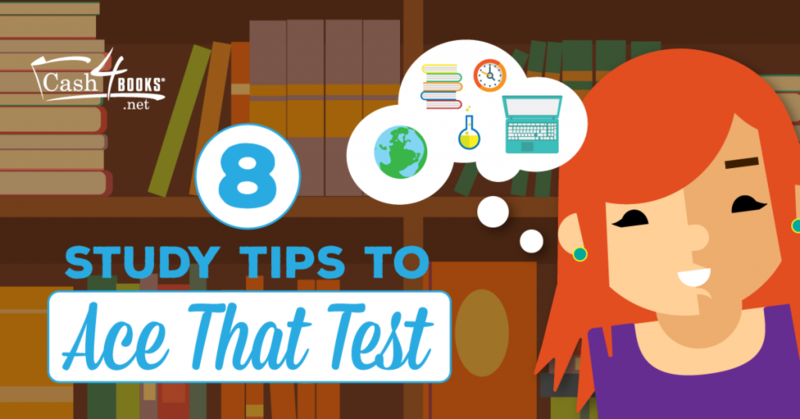 Use our study tips and go get ‘em! Good luck everyone.